Vimeira was a late frigate ship with three masts, two decks plus poop deck, an oak and teak hull with specifications: Official #806, Commercial Code Signal H.F.K.R., 1037 tons, length 165 ft., breadth 33 ft., depth 23 ft. with a draft of 16.3 ft. Her figurehead was of the Goddess Farre. The ship was registered as Vimeira, but at her launch and first recording in Lloyds, was spelt Vimiera. This was scored out and changed to Vimeira in the 1 July 1851- 30 June 1852 Register. 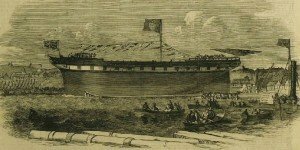 At the time of her launch on June 16, 1851, it was said, The Vimiera [sic] presents one of the most magnificent and exquisitely finished specimens of naval architecture ever produced by the shipwrights of the Wear, and one which will serve to keep up and extend their reputation as shipbuilders; whilst, it is enough to say that the model, so ably designed by Mr. Laing, has been completed with equal ability by his workmen. The ‘model’ mentioned, was on show at the Crystal Palace during the 1851 Great Exhibition. On her maiden voyage from Portsmouth on September 1, 1851 Vimeira made Port Phillip in 91 days. Vimeira was built at Sunderland in 1851 by Sir James Laing (1823-1901) at his yard located on the south bank at a bend of the River Wear at a site known as Deptford. This is not to be confused with Deptford in the east end of London on the Thames from which ships often left for Australia. Laing had followed in his father’s footsteps as a major shipbuilder on the river and became Chairman of the River Wear Commission. He was also a director of the Suez Canal Company; he was knighted in 1897. Vimeira was first owned by Duncan Dunbar II. Dunbar built and owned the biggest sailing fleet in the world in the mid-19th century. Vimeira changed hands a good many times, and eventually went into foreign ownership. At the time of her voyage as a convict ship to Western Australia, Vimeira was owned by Gellatly, Hankey & Sewell of London. This shipping company was established by Edward Gellatly at 109 Leadenhall Street, London, in 1862, and picked up a good many of Dunbar’s ships after his death (probably because he was a co-executor of Dunbar’s Will). The company was involved in marine underwriting, insurance and acted as passenger agents as well as operating their own ships. Unfortunately, the records of the early history of Gellatly, Hankey, Sewell & Co. were burnt in a fire in the company offices. 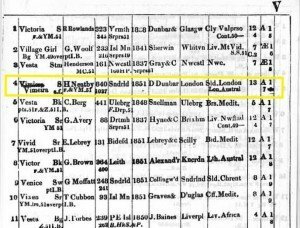 Perhaps one of the company’s earliest and most famous purchases was Edwin Fox, another convict transport to the Swan River Colony auctioned off after Duncan Dunbar’s death. 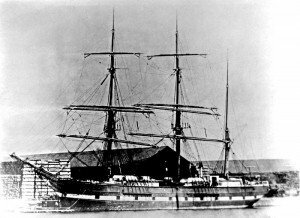 Some sources have included Vimeira in the Devitt & Moore Fleet List from 1863-1872. 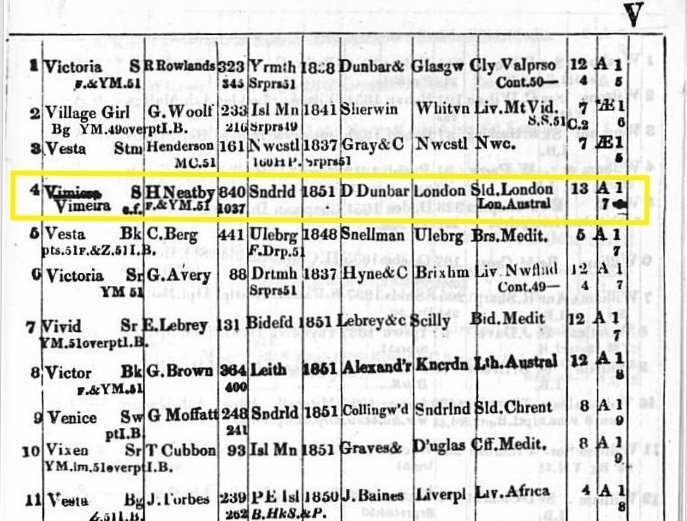 While it is possible that Devitt & Moore owned shares and/or leased the vessel during this period, I find it difficult to ignore the Gellatly listings by Lloyds Register and the Mercantile Navy Lists. 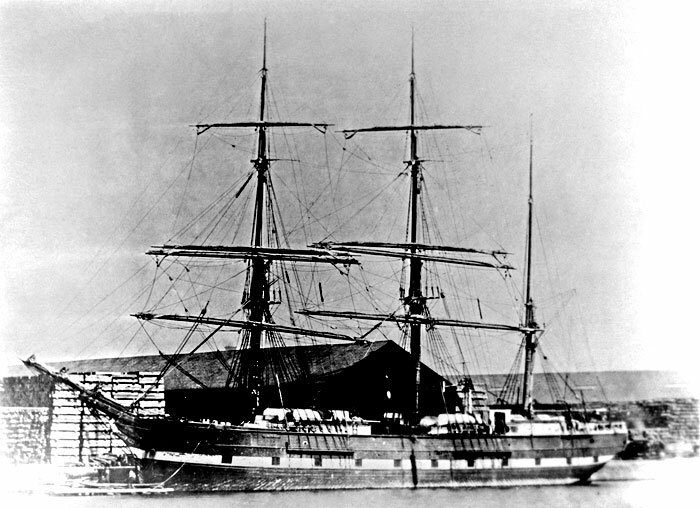 Vimeira left Portland on September 30, 1865 bound for the Swan River Colony and arrived in Fremantle on December 22, 1865 after a passage of 83 days. One of the 280 convicts who had embarked died on the voyage. Thirty convicts were former British Army soldiers who had been court martialled on various charges and sentenced to transportation. To date I have identified only one who served in the Crimean War – Edward Beaureal, but this research is a work in progress. Captain Malcolm Green commanded a crew of 47. Dr William Crawford and Mr John Williams were the surgeon superintendent and religious instructor respectively. Also on board were 30 men of the enrolled pensioner force, their 23 wives and 37 children. Four warders were on board, some with families. Only five of the enrolled pensioner force were Crimean War veterans: Edward Green, Martin O’Dea, James Henry Steele and James Watts were former infantrymen and William Blight, a Royal Marine. Dr William Crawford’s surgeon’s journal for the voyage is preserved in the National Archives, Kew. Researchers can view a copy on the Australian Joint Copying Project (AJCP) microfilm reel 3181 which is held in most major libraries and archives throughout Australia. It can also be accessed by subscription on the ancestry.co.uk website. Illustrated London News [28 Jun 1851] Website. Surgeon Superintendent’s Journal – ancestry.com Website.